Headline from Interim, October 31, 1969. 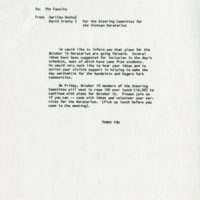 Memo to faculty and students outlining the administrative council's support for the Moratorium. Memo to faculty members from David Crosby, a member of the Mundelein Moratorium Committee. Update to faculty from the Steering Committee for the Vietnam Moratorium. Document explaining the Vietnam Moratorium. 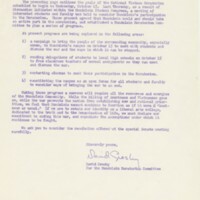 Click this image to explore both pages of this document. 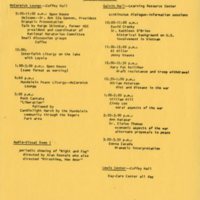 Program of events for the Vietnam Moratorium held on October 15, 1969. 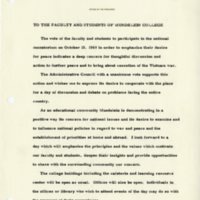 By the end of 1969, the student body finally joined forces in opposition to the Vietnam War. 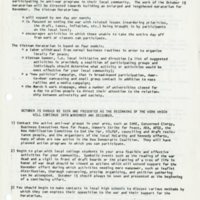 With the support of 85% of the campus, students planned and partook in the Vietnam War Moratorium, a day-long program of events taking place at colleges across the country and intended to end “business as usual” in support of cessation of the war. This event was a first at Mundelein College—students took their activities beyond simply learning about and discussing the war to hosting this strongly anti-Vietnam demonstration.